According to numerous requests from our customers has been written automated trading system that is based on the indicator signals STS. The system has a fairly stable profits and the withdrawal of loss-making transactions without loss with the help of the averaging method with elements of Martingale. Advisor allows you to make a profit of 3-5% per day with little risk, and about 10-15% with an increase in risk. The system can be used with the default settings and use its settings after the optimization. 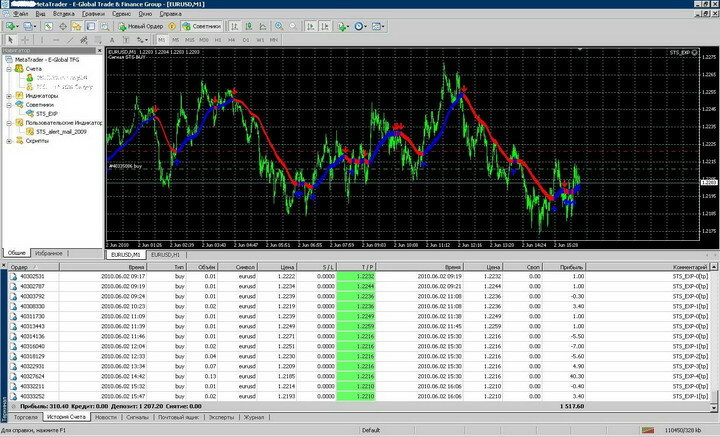 This allows to increase profits, but the default settings are selected optimal for most currency pairs. When the counselor should be a little wary of the unpredictable price hikes (around 400 points or more), which may happen during the war, a major terrorist attack or an economic crisis. Although at times like these, I think, self-study any counselor is not desirable. The work should be suspended for the time necessary for that market to "digest" the situation. STS-EXP - an automatic system, advisor or expert is called, which automatically (without human intervention) is able to trade almost any currency pair with four characters after the decimal point. Trading without human intervention is not affected by human factors. What does a trader? He earns on currency fluctuations. Everybody knows it. But not everyone knows that earn a rate fluctuations - maybe not every trader. A stable successful game in the currency market - the lot of very, very few. A trader can succeed only in one case: if it is to hold a pre-existing plan. It is this "plan" is the STS-EXP, which should be incorporated in the algorithm, and it is not subject to psychological pressure. Which allows to obtain a steady income, even a novice, just starting their thorny path trader. We bought earlier indicator STS 20% discount. To do this in the "Discount", enter your number WMID, from which you make payment indicator and click "Save."